The Kansas City Royals have fired manager Trey Hillman. I believe Hillman was managing the way General Manager Dayton Moore wanted him to manage. Moore wanted this team to win this season using veteran talent rather than continue to rebuild with younger players. If the Royals have reached the point of firing the manager, I hope that they have also seen that the present philosophy used to run the team was not working either. If you want more on why Hillman is gone read Rany on the Royal's Hillman's Last Stand. The Royals need to utilize the most talented players on their roster and those are also the younger players. Below are a few players you might expect to see increased playing time with new manager Ned Yost (formerly of the Milwaukee Brewers) at the helm, and one player I have a hunch will make an impact before the end of the season. Mike Aviles, Shortstop - Avilles is playing a lot now but I expect the Yunisky Betancourt appearances to become less and less frequent. Kila Ka'aihue, First Baseman - Jose Guillen will not be a member of the Royals' next winning team. Ka'aihue could very well be the starting first baseman or Designated Hitter. He can hit and deserves to play every day. Alex Gordon, Third Baseman - The Royals need Gordon to be all that he can be even if that is not quite what they may have once hoped. He needs another chance and the Royals have little to lose by giving it to him. Mitch Maier, Outfielder - Maier has the ability to hit 10-12 homers and steal 10-15 bases over a full season in the majors. 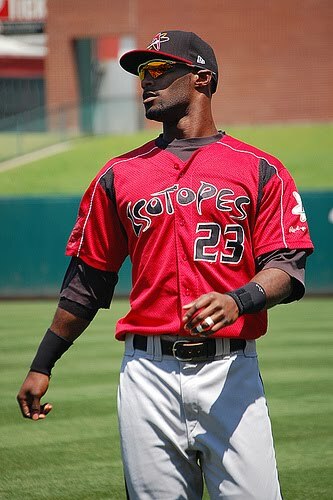 Jai Miller, Outfielder - Last year for Triple-A New Orleans he had 16 homers, 52 RBIs and a .289 average. The much anticipated professional debut for highly touted Cuban shortstop prospect Adeiny Hechavarria will be made on Friday night for Dunedin as the Blue Jays take on the FSL North Division leading Clearwater Threshers at 7 p.m. at Dunedin Stadium. Hechavarria is expected to be with Dunedin for a short while before seeing time at Double-A New Hampshire. His play with the Fishercats will then dictate his path to the Major Leagues either with a September call-up this year or a shot at the shortstop job in 2011. Boras: Hank Blalock - promote him or let him become free agent! Agent Scott Boras indicated Tuesday that Blalock would activate the out clause in his Triple-A contract within the next week, forcing the Rays to either promote him to the big-league team or allow him to become a free agent and sign elsewhere. Blalock, 29, has been sizzling at Durham, with an International League-leading .366 average plus four homers, 23 RBIs (in 24 games) and a .959 OPS, while playing third base regularly. Rehabbing Red Sox outfielder Mike Cameron believes that even if he can make it back on the field through simple rehab of his sports hernia, he'll still undergo postseason surgery to correct the problem. While immediate surgery seems to be ruled out, and Cameron told the Providence Journal he could return to the Sox Monday, the outfielder indicated that he is still in significant pain from the injury, which he believes he initially suffered during spring training. Eric Young, Jr. never made it to the dugout. He reported to Coors Field with a lump in the middle of his right tibia and was sent to a local hospital, where x-rays revealed a stress fracture. Young sustained the injury while awkwardly rounding first base in the seventh inning of Thursday's game. He continued to play before complaining of soreness in the ninth inning.